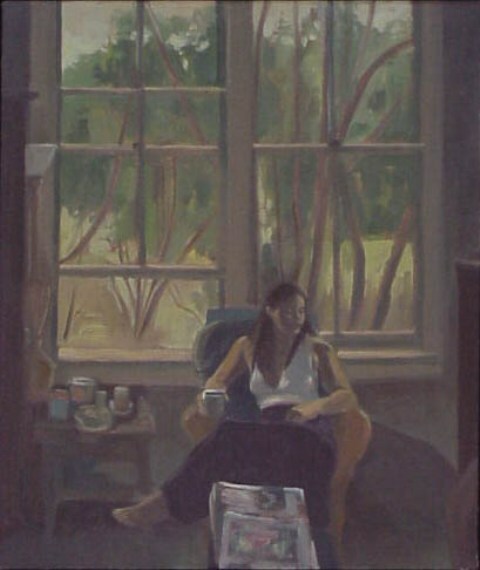 I see my artwork, both sculpture and painting as personal, expressive and representational in nature focusing, in painting, primarily on introspective figures in interiors, in sculpture I tend toward figurative images that are designed to accent or enhance architectural structures or environments; I also explore the expressive possibilities in figures in landscapes through painting and drawing. By creating a sense of visual unity through tonal structure and analogous colors, it is my hope that my paintings of figures in interiors evoke a sense of stillness and peace in the viewer. I see the external as a metaphor for the internal. I depict figures in environments that reflect a sense of inner peace and stability, perhaps introspection and with a meditative quality that points to the importance and meaning in everyday actions. By focusing in my paintings on the mundane daily activities of an individual and treating them with attention and concern, I am hopefully presenting a view which can raise awareness in the viewer for such things in their own lives. The simple and unadorned appearance of concrete has long fascinated me. I enjoy the ways in which it becomes part of the environment in which it is placed. It has a quality that works well with architecture and natural environments, which are the spaces I have generally sculpted for. Metal also is interesting in the same way, it can become integrated into the environment it is placed in through time, either through a natural patina or through rusting. I see sculpture as a way to enrich an environment, spur contemplation or simply entertain.